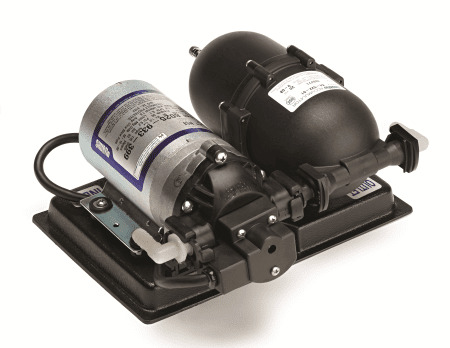 Superwater.com offers Discounted ( **Class C ) FedEx and UPS Ground Insured Shipping on all 804-002 SHURflo Mini Water Boost System 90 PSI Orders. The best-tasting fountain beverages start with the best Pressure regulation. The increase in popularity of non-carbonated drinks and the inconsistency of city water pressure and flow requires the need for a water boost to deliver quality drinks in many installations. The SHURflo Mini Water Boost System will support two standards flow valves or one fast flow valve. - Electric Water Boost pump which increases city water pressure and flow to dispenser valve which maintains brix. - Accumulator holds 6 oz. of water under pressure 24 oz. total capacity (air and liquid). - The accumulator reduces cycling. - Equiped with a SHURflo pressure reducing valve for added safety against fluctuating water pressure and flow, the pressure reducing valve eliminates the need for costly water regulators.